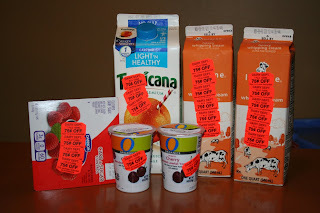 I live by a busy Safeway so I rarely find mark downs like Angela does at the one near her house, so when I started walking through the dairy and juice aisle and saw stickers everywhere I started doing the dance of joy. You know, the dance of joy from Balki on Perfect Strangers? Okay, well it was 20 years ago (am I really that old?). This does all need to be consumed soon as it is near the expiration dates, but with a toddler who devours 3 yogurt cups in a serving and a husband who downs orange juice like crazy this won’t be a problem. I put the whipping cream in the freezer to be used this Christmas for baking, then it will be on hand and i won’t have to shell out nearly $6 when I need it right then.